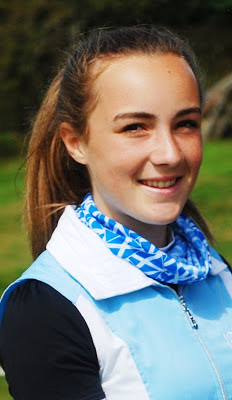 Three players sit at the top of the leaderboard in the women’s competition at the 14th West of Scotland Trophy after Penny Brown, Hazel MacGarvie (pictured below), both Stirling, and Kirsten Brown (St Andrews) all shot 78s (+7) in their first round. In the men’s competition a superlative 72 (+1) from Jordan Sundborg (Stirling) leads by two from team-mate Scott MacPherson. The women’s competition got underway in the worst of the competition with high winds and heavy rain creating very difficult conditions. Further hindering performance was the fact the first holes were all into the wind and indeed the first five holes proved to the toughest throughout the day. This difficult front nine saw MacGarvie’s +5 giving her a three-stroke lead at the halfway point. However, with slightly improving weather, the two Browns were able to reel her in, both coming back in one under par to share that first-round lead. The round of the day came in the men’s competition from Sundborg. Going out in one- under 35 was impressive and indeed only a bogey-bogey finish prevented him from recording the only sub-par round of the day. Team-mate MacPherson had early struggles, dropping three shots in his first five holes. A birdie at the 6th stopped that run and although he dropped another two shots, a birdie at 16 saw him finish the day with a creditable 74. Sharing third are a couple of the later starters from the day – Kieran Quinn (West of Scotland) and Ethan Campbell (Stirling). shooting 76 apiece to lie only four back from the leader. Kudos must go to the man lying one back from Quinn and Campbell, Matt Bell (Stirling) the only man to record an eagle during the course of the day – his 3 at the 14th helping him to stay in contention with the leaders. With further bad weather scheduled for day two the challenge will be for the leaders to back up their solid play while those further back will be hoping to make moves of their own and at least find themselves on the right side of the cut line at the end of the second round.